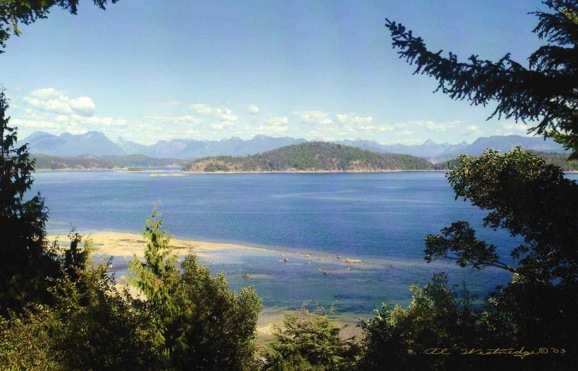 T'ai Chi Ch'uan Workshops on Cortes Island, B.C., Canada, August 2011 - Judyth O. Weaver, PhD. T’ai Chi Ch’uan has been known for generations as an exercise for longevity and relaxation and is now amazing contemporary researchers with results of enhanced immune systems, better balance, more flexibility and strength. This exercise, suitable for all ages and body types, is a moving meditation that centres and calms our minds as well as being a form of healing, of self-defense, and physical re-education. Learn the first section of Grandmaster Cheng Man-Ch’ing’s short Yang form. Come to understand the dynamics of gravity, energy, allowing yourself to be supported and moving with relaxation and grace. Morning practice begins with meditation, Qi Gong and T’ai Chi practice before breakfast. Daily sessions include thorough explanations of philosophy and examples of how T’ai Chi enhances our health, coordination, and stress reduction. No previous experience needed. Judyth’s careful approach presents T’ai Chi as an integral way of life and as an essential exercise available to anyone. Judyth rarely offers a beginning workshop independently. Join her this year on her deck overlooking a magnificent view of water & mountains to learn, relearn, or just deepen your practice with beginner’s mind. Tuition $550 US/Canadian equivalent. $200 US deposit to reserve space in workshop. Meals and accommodations extra. There are tenting possibilities on Judyths property and/or bunking spaces in sleeping lofts of the studio. Please register directly with Judyth Weaver: 206-361-4124/ June 17, July & August: 250-935-8500 or through this website. Judyth O. Weaver received authorization to teach T’ai Chi Ch’uan from Grandmaster Cheng Man-Ch’ing’s Shr Jung Center for Culture and the Arts in 1971, and has been teaching regularly since then. She has taught throughout the world, always focusing on the authenticity, purity and simplicity of this short Yang form in order to promote self-help, relaxation, and coordination of body, mind and spirit. Judyth created the T’ai Chi Ch’uan program at Naropa Institute (now Naropa University) in Boulder, Colorado in 1974, and headed that program for three years. She also gives classes, workshops, and private lessons in Seattle, Washington where she lives, in Mexico in the winter, and on Cortes Island, B.B., Canada during the summers.